This citrus bomb of a hop, is known as "Super Cascade" (higher alpha version of Cascade) and can be used for both bittering and aroma. Unique passion fruit, pine, earthy and citrus characteristics. Our experience is that you'll either love it or hate it. A dual purpose hop with medium intensity spice and piney characteristics, with subtle citrus tones (grapefruit). A high alpha hop with an intensely citrus flavor and aroma combined with a woody background. Used for both bittering and aroma. Also know as Tomahawk. With it's distinctive grapefruit aroma/flavor, Cascade is the quintessential American Ale aroma/flavor hop. It adds a citrusy character even when used as a bittering hop. 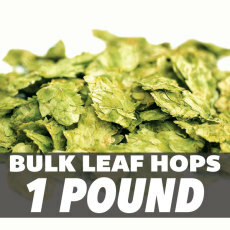 Amarillo Leaf Hops - 1 lb. Citrus forward with good bittering properties too. Chinook Leaf Hops - 1 lb. Used as an aroma hop. Mild and pleasant, with a slightly wood-earthy tone. Both loved and hated as an aroma hop. Distinct spice, earthy, onion, garlic and citrus (pink grapefruit, orange and tangerine) tones. One of the Noble hops from the Czech Republic. Spicy, with pleasant earthy, herbal and floral overtones. Grown here in the US, this is our version of the classic aroma hop from the UK. Mild wood and fruit characteristics. Will work great in all English-style ales. The classic English hop used for both bittering and aroma. Smooth and unoffensive.